This week I’ve been feeling poorly with a cold and when I posted on Twitter and Facebook about piling up my comfort films to watch (above picture), lots of people joined in and shared theirs. For me, comfort films are some of my favourite movies ones that I’ve watched countless times so I don’t need to concentrate on them – they are familiar and generally have a happy ending to cheer me up. Although occasionally I feel like watching one that will make me cry, which is why A Walk To Remember is included. Mostly it seemed our comfort films were similar – rom coms featured a lot on the lists, they have that happy ending to make you smile but also films we watched as children so they have that nostalgic quality, we maybe even watched them when poorly as kids so they still comfort us now. High school films were also popular probably as they are cheesy and fun and easy to watch. My ultimate comfort film is You’ve Got Mail. I can’t even fully explain why but I’m curling up now under the duvet to watch it and hopefully be cheered up. What makes a comfort film for you? What’s your favourite? The Railway Children, Notting Hill, and more or less anything starring Michael Cera. Oh, Bridget Jones, too. Bridget Jones is up there for me too, I always watch it at Christmas! I love “You’ve Got Mail”. Harry Potter is a good choice as you can have a good old marathon! Hope you feel better soon! Not heard of that one! It’s definitely the favourite category! Excellent choices! I always watch Serendipity at Christmas to get me into the festive mood! Ooh yes trashy TV is the best, I love the Kardashians too! New Year’s Eve is my favorite time for guilty pleasure/feel good movie marathons. There’s something nostalgic and comforting about it. Love your stack of movies there! I need to try that one again, watched it once and wasn’t sure about it. Thanks! I think my comfort films are almost always comedies, particularly the ones I’ve seen a lot as you say. Anything Monty Python, or Robin Hood: Men In Tights, or some of the silly 90s films I watched growing up like the older Jim Carrey films, etc. Also, oddly, Jackie Chan movies always cheer me up. 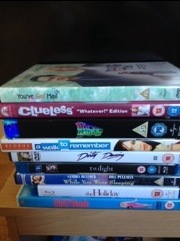 Comedies are always good for cheering up!! Blues Brothers, Groundhog Day, Slapshot. Guilty secret – The Bridges of Madison County. Interesting in a raised eyebrow sour of a way? hmm. Dirty Dancing is definitely one of mine. As is Empire Records, A Bug’s Life, and The Crow.